Phineas. (He scoots to her on his knees) Then why not say, yes? Phoebe. (Trying to close the door quickly, Phoebe comes R of Phineas) Phineas, I’m afraid I have bad news for you. Mary has recently reconsidered, and, engaging in the woman’s prerogative, has decided that she would now prefer to be wedded to a man of means. Phineas. (Rising and addressing Mary) Does that mean I am again rejected? Mary. I’m afraid so. I am afraid I can never be yours. But as you are already here, I should like to take up a business proposition with you. Phineas. (Aside) The hussy has peremptorily rejected my proffered protestations of love, but now she has the audacity to request a benefaction from me? (To Mary) I should be delighted to entertain any proposition you might advance. (Aside) It costs nothing to listen. Nothing to be polite. Mary. I would request an advance of $2000. I wish to convert my home into a general store and inn for the purpose of assisting our less fortunate neighbors through these adversities. Phineas. (He takes Mary’s hand) In that case, as I am your neighbor, would you not consider assisting me by becoming my wife? After all, who has experienced more adversity than I? Mary. (She withdraws her hand as if from a trap, and backs off a step) I will speak plainly, Mr. Fourberie. In the past, I have watched you, as you, in what appeared to be rapacious fashion, have amassed a small fortune for your personal benefit. (She escapes by crossing past Phineas and Phoebe DSR) I could never marry a man who puts his personal welfare (She turns back to him) before the needs of a suffering humanity. Phineas. I will not deny what you say. I have, in the past, placed my own needs first. (Aside) Ah ha! An opening! (To Mary) Perhaps if I demonstrated a new found benevolence, you might reconsider your rejection? Phoebe. Don’t get your hopes up. Mary. (Crossing to Phoebe and touching her elbow) Please, Auntie. (She then crosses to Phineas as Phoebe counters) You have my assurance, Sir, that I shall always keep an open mind. Phoebe. (Aside) My naive niece would be safer keeping a closed mind, and open eyes. I have long since learned that one cannot put faith in snakes, skunks and Fourberies. Running River. (Putting down his cards, seeking to gull Merriweather and therefore using his stereotype character and speech) Running River have three Chiefs. Running River win. Merriweather. (Still taking Running River for a savage) Not so fast, faithful Indian companion. I have a flush. (Proudly showing his hand) I win. Running River. (Looking at Merriweather’s flush). Flush? Phooey on flush? Running River think white man cheat. (Producing his tomahawk[prop]) Maresnest make new rules. Running River have three heap big Chiefs. Maresnest has nothing. Maresnest has only two, three, five, six and nine. Merriweather. Note, faithful friend, that all my cards are hearts. Recall, great chief, that three of a kind beats two pair. A straight beats three of a kind, and a flush beats a straight. Running River. (Rising in Place) White man’s rules no good. ... (He appears to think for a second) Then what beat flush? Running River. What makes house get full? Merriweather. Three of a kind and a pair. Running River. (Sitting, and checking his cards) Me got pair,too. Me got two twos. (Enthusiastically) Me got outhouse! Merriweather. What? Let me see. (Running River shows the pair of deuces) Great Caesar’s ghost, man! So you have! Kings over deuces! Why didn’t you say so? Running River. Me forget about out houses (About to scoop up pot) You no win no more? Merriweather. Not an “out house,” you benighted savage. A “full house” beats a flush. Honesty compels me to admit that you win. The pot is yours. Running River. (Rising) White man’s new rule good. (He reaches down and scoops up pot) Me take pot. You honest flimflammer. Running River trust Merriweather Maresnest again. Merriweather. (Rising in place) You will, of course, give me a chance to get even? Merriweather. (Merriweather causes him to stop and turn back) Where is there to go? The whole town has washed away. When the town of Polecat Point is all but washed away by the raging spring waters of the Mississippi River, Phineas Fourberie, the town’s first citizen and banker, plots to recoup the loss of his personal fortune contained in his great iron safe which he believes may have come to rest amid the sawyers along the property of his neighbor, dear little Mary Goodperson. Mary, meanwhile, with the aid Phoebe Forthright and their faithful Indian friend, Running River, has set in motion a plan to assist their less fortunate neighbors who have lost all in the flood. Fourberie, seeing the opening he awaits, takes advantage of the situation by providing Mary with money for her venture, taking a mortgage on her property, and then acting to make certain her venture fails. Phineas’ plan, however, gets mucked up when a couple of Shakespearean actors arrive and concoct a scheme to con Phineas out of his money. But unbeknownst to them, Mary’s visiting uncle has devised a plan to swindle the actors. 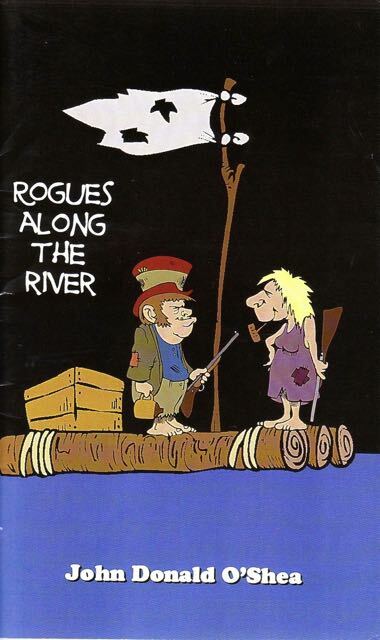 And to top if off, two "river folk" arrive with their sights set on robbing the bank and running off with Phineas’ safe. Before the mandatory happy denouement, every rogue takes his/her best shot at gulling his/her most gullible "neighbor." In the end, with all the drama, double-dealing, and bad acting, there’s only one thing left to do—join forces, start up a repertory theatre, and perform melodramas. After all, there’s already a resident villain, a virtuous heroine, a charming curmudgeon, a canny aunt, a pair of Shakespearean actors, as well as a couple of river folk - no to mention a Harvard educated native-American - all ready to play the great comedic roles! Mary's spinster aunt. Canny, blunt and honest. affable man of the world. with the art of the scam. beauty. Gull's helpmate in all things. spousal match for her husband.